It is always a pleasure to visit the sumptuous J. Pierpont Morgan Museum and Library located in the Murray Hill section of New York City. 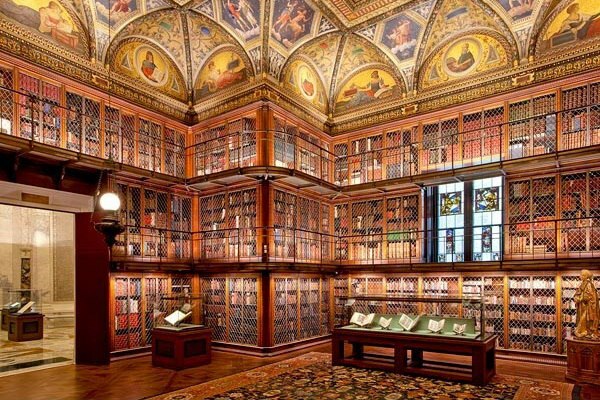 Built in 1906, designed by the esteemed architectural firm of McKim, Meade and White, it is breathtakingly beautiful as well as a unique source of medieval riches, housing one of the smallest yet select collection of illuminated manuscripts and medieval art. Every once in a while, the curators dip into this archival treasure trove and fish out something that makes spending the exorbitant exhibition costs well worth it! This year, they have given us a tiny but interesting group of printed manuscripts from the late 15th century produced in Ghent and London from the printing press of English merchant and diplomat, William Caxton. Caxton came twenty years after Johann Gutenberg but apparently wasted no time learning the craft and using his knowledge of English, Latin and French to produce key works of literature, ranging from the Bible to Chaucer and Malory, an early encyclopedia as well as the first illustrated English book, “The Mirror of the World” published in 1481. In this, of course, he was helped along by those highly intelligent royals – The Plantagenets – starting with Margaret of York (Duchess of Burgundy) who patronized the finest book artists in Europe. On display is one of her illuminated manuscripts called “Apocalypse” written or translated by the scribe, David Aubert, and published in 1475. In 1476, probably encouraged by Margaret,Caxton set up a press at Westminster Abby with illustrious clients such as Earl Rivers and the future Richard the Third. Sadly, while much emphasis is placed on Margaret’s and Edward IV’s encouragement of Caxton, there is no mention of Richard the Third in the exhibit. 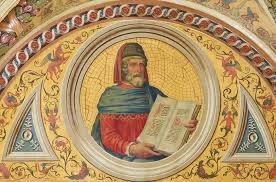 As Ricardians know, Richard had a library of his own and was a great champion of the English language as well as a patron of Caxton. Two books on display – one an unusual Canterbury Tales with woodcuttings and a volume simply called”The Royal Book,” a much-used edition with a leather embossed cover and rubricated lettering, date directly from his reign (1483). Perhaps the most interesting, and certainly the most intimate exhibit is a printed indulgence from the workshop of Caxton requesting that Richard Hopton, headmaster of Eton College, be forgiven for promoting war against the Ottomans. Included is the papal seal of Pope Innocent VIII – a blood-red wax replica of what looks like a mitre worn by a bishop. The seal was so carefully broken that it retains a perfect shape. 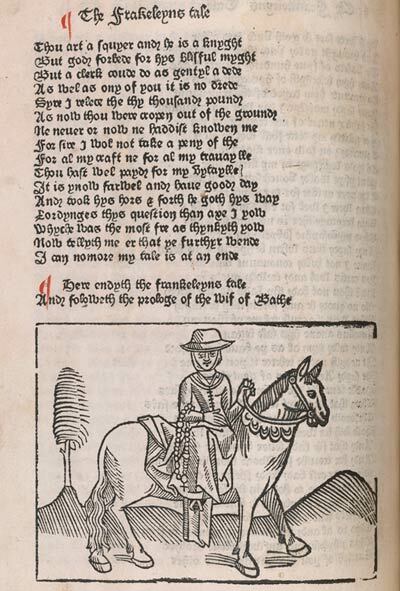 Perhaps the most important takeaway of this exhibition is Caxton’s work to help stabilize the English language by promoting one dialect – the so-called London dialect – which went on to form the basis of modern English. The Exhibition last through September 20, 2015. Reblogged this on A Sprig of Bloom.